Northwest sophomore Val Eury had a game high 18 points in the Mohawks loss to Minford Thursday night. Minford sophomore Livi Shonkwiler played a huge role in the Falcons gameplan defensively in their win Thursday night over Northwest. MINFORD – It wasn’t the prettiest of victories if you’re a Minford fan, but in the end, the Falcons grinded out a double digit victory at home over a much improved Northwest team, 55-43. Davis continued to say that it wasn’t for the lack of trying on the Mohawks part, they gave them one heck of a game on the Falcons senior night. That quote from Davis is maybe an understatement. One of the most improved teams, if not the most improved team in the district in Northwest, hung within at least two possessions for most of the game. Even heading into the fourth quarter, Northwest held a one point lead over the Falcons as they hoped for a senior night road upset win. But, in the end, it was the Falcons defense, and some young mistakes from Northwest, that propelled the Minford win. In the final frame, Minford outscored the Mohawks 17-4 to walk away with the twelve point decision. Going into the fourth quarter trailing by one, it wasn’t a frustrating conversation that Davis had with his team, it was a reassuring one. Two of the key players that helped fuel the Mohawks lead through three quarters were two sophomores, Val Eury and Haidyn Wamsley. In the first three quarters, if Eury missed anything she threw up, it was a surprise. The talented sophomore finished with a game high 18 points, 14 of which came in the first 16 minutes of play. Wamsley finished second in scoring for the game with 15 for the night. As long as the young Mohawks continue to grow and improve, look out for them as a perennial threat in the SOC II race in years to come. On a night in which the two Minford seniors, Caitlyn Puckett and Ashley Blankenship, were honored, it was a sophomore filled night, including for Minford’s Livi Shonkwiler. Shonkwiler finished with 10 points to crack double digits and nearly double digit steals in one of her most impactful games of the season. In their final games at home, senior Ashley Blankenship finished with a team high 14 points, and senior Caitlyn Puckett finished with 11. Minford will face off against Waverly this Saturday before their sectional matchup on Monday at Valley against a much improved Portsmouth squad. Northwest is done for the regular season and will face off against Ironton on Wednesday at Valley in their opening sectional matchup. 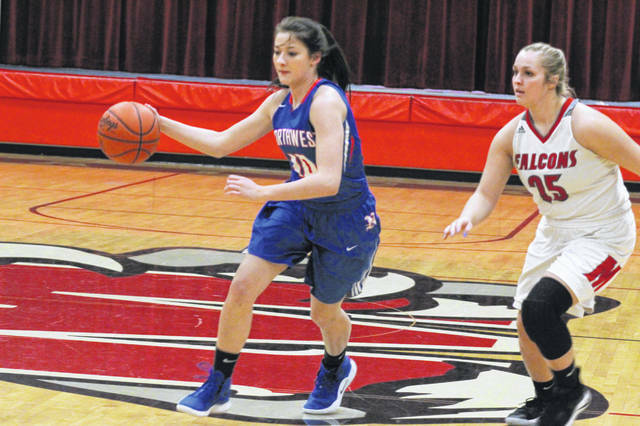 https://www.portsmouth-dailytimes.com/wp-content/uploads/sites/28/2019/02/web1_IMG_9114.jpgNorthwest sophomore Val Eury had a game high 18 points in the Mohawks loss to Minford Thursday night. 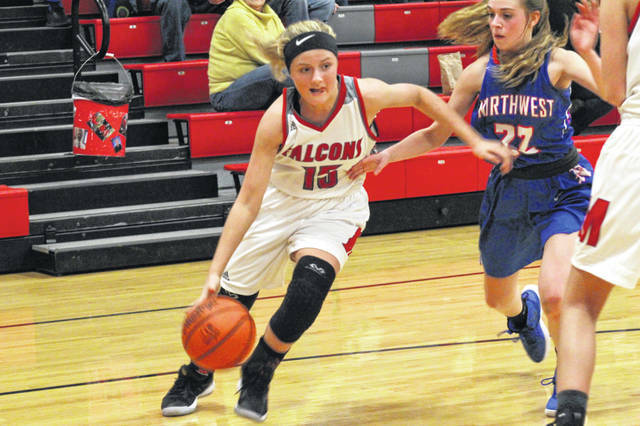 Minford sophomore Livi Shonkwiler played a huge role in the Falcons gameplan defensively in their win Thursday night over Northwest.